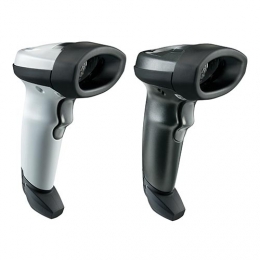 The handheld LS2208 scanner from Zebra Technologies offers high quality scan performance at a reasonable price. It is ideal for a large number of applications that require fast, reliable and efficient bar code scans. The LS2208 offers optimised scan performance and durability, which makes it ideal for retail, warehouse and workshop applications as well as in inpatient centres or laboratories. The balanced combination of performance and robustness lead to increased productivity and efficiency, while at the same time reducing operational and maintenance costs. Reads 1D bar codes at 100 scans/sec. More than a hundred scans per second and a large field of view make the LS2208 a fast and accurate scanner that always guarantees optimum scan cycles. The integrated 650 nm laser reads 100 EAN bar codes from up to 40 cm distance for perfect ergonomics, which eventually leads to a higher working efficiency. The scanner is not affected by direct sunlight or artificial lighting. This prevents read errors related to reflected light efficiently and protects you from subsequent problems during data processing. The LS2208 is a classic scanner with pistol grip and trigger. This design makes the scanner very easy to use and ergonomic. Even untrained workers know intuitively how to use the scanner within seconds. Its ergonomic and balanced form factor reduces fatigue effectively while operational comfort is increased, which has a strong positive effect on the workers speed and performance. Its integrated decoder recognises a large number of 1D bar codes automatically and sends them to the connected host system. More importantly, the decoder is fully upgradeable and can adopt future bar code types easily. It is also a universal scanner that works with all interfaces. Simply choose the compatible interface cable for your specific application. Its programmable multi-interface allows communication with nearly all computer and POS systems as well as industrial and medical equipment. The scanner is fully plug play capable, which means that you only require a few simple steps to connect it to the host and save precious time with installation and setup procedures. Even supported interface types can be upgraded for future interface generations. The LS2208 was designed for daily continuous operation under professional conditions and has successfully passed drop tests from 1.5 m height on concrete surfaces. A patented design with a single circuit board prevents problems that usually occur with several interconnected boards and thus eliminates one of the most frequent causes of failure. Furthermore, the scanner features a liquid polymer scan element that offers inherent impact resistance and guarantees reliable operation. Scratch-resistant hardened glass leads to continuously high precision. For the rare case that maintenance is required, Zebra offers the support contract Advance Exchange, which provides replacements for defect devices on the following working day. This special offer already includes the unique Zebra service Comprehensive Coverage, a service that covers not only normal wear and tear but also damage at scan windows, scan elements, housings etc. caused by accidents - at no extra cost. These service options are ordered together with the scanner and virtually eliminate any repair costs during the whole service life of the scanner.